I'm so happy you found your way back to my blog! I wish this could have been easier, but I didn't have a choice and had to change the link to my blog without having the time to announce it on my old blog and invite you to come here. Blogspot didn't change the follower link on your blog to my blog automatically, that means: You don't follow my blog anymore and I don't want to loose you as a follower and would like to kindly invite you to follow me. On the Blogger bar on the top of the blog > “Follow” > “Unfollow” > click on “Follow” again > “Follow publicly as XY” > "Follow"
Please make sure you see this newest post on your dashboard again, then it worked! Your picture should also be visible on my Friend Connect as the newest follower. 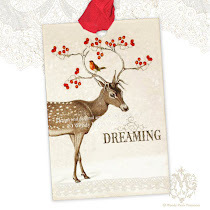 I would like to thank you for your loyalty and give you the chance to win this adorable cream Toile de Jouy heart ornament from my shop Blanc & Caramel (please take a look!). All you have to do is to follow me again and leave a comment that you did so. Of course new followers are more than welcome to participate too! The giveaway will be up until June 10, 2010, midnight in Paris. It's open to everyone (international). When I'm going to post about the winner on Friday, June 11, watch out if my new post is visible on your dashboard. If not, the new subscription didn't work... then just try again. Thank you so much for your support, I appreciate it so much! Ich bin so froh, dass ihr wieder hier seid! Ich wünschte, es wäre einfacher gewesen, aber ich hatte keine andere Wahl und musste den Link von meinem Blog ändern. Ich konnte euch auf meinem alten Blog znicht mehr informieren und euch hierher einladen. Blogspot hat den Leser-Link auf eurem Blog zu meinem Blog nicht automatisch geändert. Ihr seid nun kein Leser meines Blogs mehr. Ich möchte euch aber als Leser nicht verlieren und möchte euch gerne einladen, euch wieder als Leser einzutragen. Auf der Bloggerleiste über dem Blog links oben > „regelmässig lesen“ > „nicht mehr regelmässig lesen“ > nochmals „regelmässig lesen“ > „diesen Blog verfolgen. Öffentlicher Leser als XY“ > "regelmässig lesen"
Bitte schaut nach, ob ihr diesen neusten Eintrag auf eurem Dashboard sieht, dann hat es geklappt! Euer Bild sollte auch auf meinem Friend Connect als neuster Leser erscheinen. Eventuell ist abmelden und wieder anmelden direkt auf Google Friend Connect möglich (aber: auch wenn ihr euer Bild noch seht, seid ihr noch nicht Leser meines neuen Blogs). Ich möchte euch für eure Treue danken und gebe euch die Chance, dieses süsse cremefarbene Toile de Jouy-Herz aus meinem Shop Blanc & Caramel (schaut mal vorbei!) zu gewinnen. Ihr müsst euch einfach wieder als Leser eintragen und mir dazu einen Kommentar hinterlassen, das ist alles! Neue Leser machen natürlich selbstverständlich auch mit! Der Giveaway dauert bis am 10. Juni 2010, Mitternacht in Paris. Jeder kann mitmachen, ich verschicke international. Wenn ich am Freitag, 11. Juni einen Eintrag über den Gewinner mache, sollte der Post auf eurem Dashboard erscheinen. Wenn nicht, hats nicht geklappt... bitte dann einfach nochmals versuchen. Thank you for letting me know about the change! Thank you for letting me know on my blog - I am now following you again!!! I received my Bonheur pillow this week and I LOVE it!! I haven't gotten around to Etsy yet to thank you! AND I'd love the opportunity to win another pillow from you!!!!! I have unsubscribed and followed again AND I will post your giveaway on my sidebar! I have found you again! Thanks for leaving the post of my blog and entering my giveaway. I'll post yours on my sidebar! Thank you for letting mw know! I wouldn't want to miss a thing! Your giveaway is so sweet-I have my fingers crossed! Hi Chani, thanks for letting me know you changed your blog link. I am following now. Love your giveaway, beautiful. Hello Chani, and thank you for letting me know about the changes. I just did as you said to unfollow and am now following again. I'll be happy to add your giveaway and new link to my blog! Please enter me for that adorable heart!! Thanks for the info ~ I'm following again. Thanks for the chance to win the very pretty heart! I've added your giveaway to my left sidebar. Changed the links and everything's fine now again. P.S. Now I also added your giveaway to my blog's sidebar. sono felice di poterti nuovamente seguire, grazie a te!!! Ti linko volentieri. ich habe es endlich geschafft, mich als Leserin bei dir einzutragen, gleich auf deinem "neuen" Blog. Ich hoffe, dass du alle deine Leser wieder "einsammeln" kannst. so ganz hat es bei mir noch nicht geklappt,aber ich setze den Link auf meine Seite, so dass ich immer sehe, wenn du etwas Neues gepostet hast, und versuche es weiter. I'M YOUR FOLLOWER IN THIS BLOG ALSO. 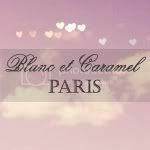 NOW I'LL GO TO POST YOU LOGO FOR THIS LOVELY CANDY. danke für deinen Hinweis auf meinem Blog. Natürlich bin ich gerne wieder Leserin deines Blogs!!! Und wie ich sehe, bin ich schon Nr 269 ;) Das ging ja schnell. Neu verlinkt und jetzt funktioniert's. Alle alten Posts sind nun 1 Tag alt. Hat also geklappt mit der Umwandlung. OK I'm singed up here again. Tahnks for the how to steps in doing that. I see you have reached your goal!! Thanks for entering my name for this lovely heart. Hello my dear Chani! Thank you to let me know about your change! Love your new name and your giveaway too! Just linked it on my sidebar and of course I'm a follower again!!! Thank you for letting me know. I was just thinking of checking in to see if everything was ok as I hadn't seen a post from you on my homepage recently. I am absolutely a follower and subscriber again. In fact, I was thinking of writing about your beautiful blog very soon! Thanks for letting me know about the switch. :) I'm following you! I'll follow you around blogland wherever you are! Silly question and probably easy to answer - how do I know the price of your items in US dollars? Sign me up for your beautiful giveaway! da haben wir uns ja wieder :o)) Das Herz ist wunderschön!! HI, I am indeed a follower again. Love to win your giveaway. I invite you to follow my blog also. Have a nice weekend! Thanks for letting me know this blogchange. I'm following again. Normalerweise sollte ich jetzt auch wieder als ´Follower´ eingetragen sein hier, habe aber auch immer noch den Link deines Blogs auf meinem. Thanks for the heads up. I signed up to be a follower again. I hope it worked. Such a sweet offering.I'd love to be the proud new owner! Thanks for the chance to win this lovely heart! Now following on the current site. Hi, i'm a follower again! And i will put a link into my blog! This site is such a wonderful one and I am happy to become a follower. If I had a blog I would spread the word. The giveaway is a nice bonus. I follow you again with your new url. Lovely give-away. I will place a note on my blog about that. erst durch die Änderung Deines Blognamens hab ich Dich hier gefunden und fühle mich gleich wohl in Deinem Blog. Ich komme gerne wieder ! Verlinkung ist natürlich Ehrensache ! es scheint geklappt zu haben ... danke für den Hinweis, möchte doch bei Dir nichts verpassen. Jetzt hast Du sogar noch mehr Leser als vorher. Thank you for your comment, I do not want to miss any posts! I am definitely a follower again!! Sign me up for your sweet giveaway. I just found you, but I'm definitely a follower now! Natürlich möchte ich dich auch weiterhin verfolgen. Deshalb habe ich mich bei dir als Verfolger angemeldet. Ich weiß aber nicht, ob ich bei dir gelistet bin. Auf jeden Fall läuft dein Blog bei mir jetzt unter deinem neuen Namen. Also bekomme ich alles Neue von dir mit. Ich finde deinen neuen Blognamen übrigens sehr schön. Überhaupt schaue ich immer sehr gerne bei dir vorbei - auch wenn ich nicht so oft schreibe. Ich wünsche dir ein harmonisches Wochenende! Ich mache die nächsten zwei Tage bei einem Kunsthandwerkermarkt mit und freue mich sehr darauf! Thank you for your kind left a comment on our blog. Hallo liebe Chani, ganz lieben DAnk für deine Einladung zum Giveaway! Da mache ich doch sehr gerne mit, bei diesem wunderschönen Herzi!! So ich habe mich nun auch erst aus deiner Verfolgerliste aus und dann wieder eingetragen! Bei "Regelmässig lesen" wurde mir angezeigt das ich Dich unter neuem Namen schon lese, also hoffe ich mal das dem so ist! Du Arme, das war sicher eine Heidenarbeit, da beneide ich Dich nicht drum, soviel Schreiberei auch, denn Du hast sicher auch viele mails geschrieben um auf dein Problem hinzuweisen... nun hast Du es geschafft und bist selber sicher auch geschafft lach!! I hope i did it allright, the follow up thing I mean. I do see my icon in your sidebar. I would not want to miss any of your posts :) Thanks for the chance to this awesome giveaway, love your work. Will post it at my candy page! Wow, I just popped over to your etsy shop, what beautiful creations you have! Your tags are just lovely. Congratulations on your new great blog! Thanks for letting me know! Success! New follower. Happiness in your new "home". 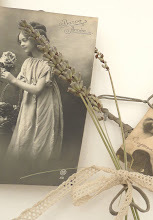 New reader here, came via Vale's blog Les Cotrions.. another great blog to read, and as I adore Paris so much the better. I have a few very good friends living over there, and have just returned back to the UK a few weeks ago. Have just become a follower ! Thank you for visiting my blog today and for your sweet comment! I'm a follower as of today, and would love to enter your generous giveaway! 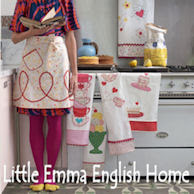 I just LOVE your blog (I've admired your etsy shop before), and I will be back for many more visits! Happy Weekend! Hello Chani how nice your blog! congratulations your work is simply amazing. I hope I have done everything as you explained your advocate if I had not yet let me know because then I have done something wrong, calmer tomorrow wont to dedicate my blog post about your giveaway, thanks for inviting me and I am happy to participate ... with the hope of being able to take home your beautiful, beautiful heart! Thank you Chani for the notice on the change, I have made it, and joined the new follow list. The sweet heart would be lovely! Hello dear Chani, thank you for the notice of the change. Although I not always leave a comment, I always follow your beautiful Blog and I won't miss a post. Your give away is so lovely and what a sweet gesture. But I will let my change go, cause I have in the last months win 3 times a beautiful give away, so I now want to increase the oppertunities for someone who has never won. 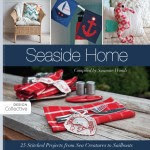 Hi Chani, Great blog and shop! I would love to win the heart ornament!! I dear Chani, that's an amazing giveaway, please count me in!!! hello chani....i'm glad I've found you! I'm in for your giveaway! and I'm a follower! wow, thanks for the giveaway, your blog is lovely! Ciao, sono capitata qui per caso.... molto bello il tuo blog.... Partecipo molto volentieri al tuo give-away. I have already commented ,, but just noticed the date the draw is .. Its my birthday :-) I wonder if I will be lucky ! I am a new follower to your lovely blog. 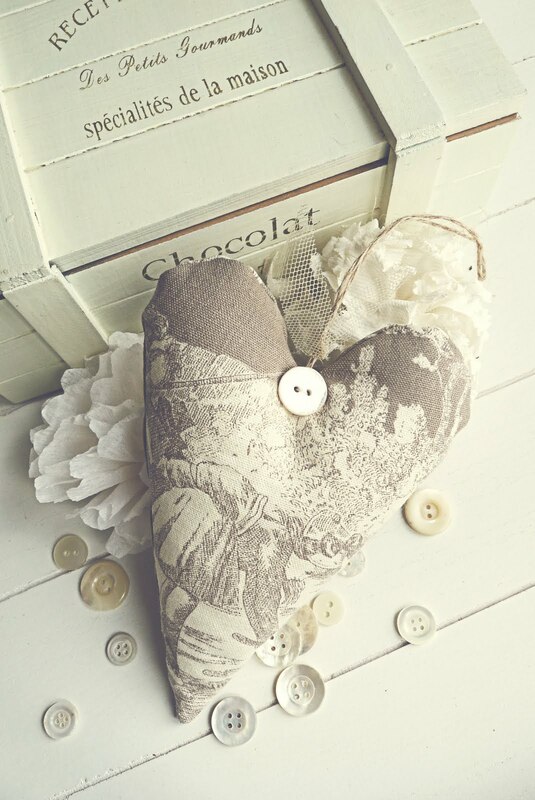 I would be very excited to win the lovely toile heart! Your blog and Etsy store is lovely, also the beautiful toile heart. Hi I'm a brand new follower! 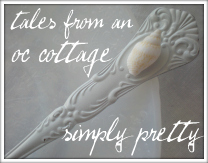 Your blog looks lovely! I would love to win this lovely little heart. Your creations are beautiful. I am now following (I'm one of the silhouettes at the end of your list). Halli Hallo, ich bin durch Zufall auf Deinen Blog gestossen und find das Candy wunderschön! Supi Klasse! Ich werd es gleich in meiner Sidebar verlinken und möchte Dich aber auch zu meinem Candy einladen! Ganz viele liebe Grüsse und einen schönen Tag. Thank you for this beautiful giveaway! Gald to have you with a new name! I am a new followerer, and think your giveaway is just lovely. Took a bit of detective work but I found you again! I just love your blog and the website. Chani, I'm a follower! Your give-away is so sweet. Thanks for the chance to win it. What a delight to discover your blog - I just signed on as your 300th follower! 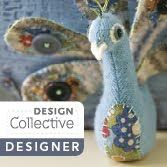 Your giveaway is lovely - I will be adding it to my sidebar at Create With Joy! Please stop by when you have a moment - I'd be delighted if you joined my family of Kindred Spirits! Gerne mache auch ich bei Deiner schönen Verlosung mit! Und Verlinken werde ich sogleich. What a beautiful giveaway.. I really want to be part of this. Ich würde auch wieder sehr gerne bei deiner Verlosung teilnehmen! Das Herzchen ist sooo zauberhaft. Thanks for letting me knowe you've moved! Love to win these goodies of yours, you va count me in! I'll put a link on my sidebar too..
A beautiful giveaway! I'm following you~! Ich habe dich via Marlis gefunden. sei lieb gegruesst aus den land der deiche.